Six-week online poetry class intended to inspire braver and more innovative work. Open to all ages and experience. Course begins on March 12. More information. 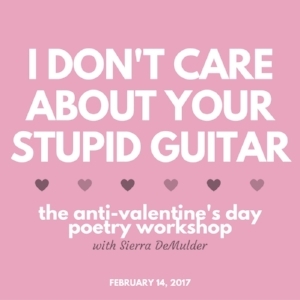 Online poetry workshop that revisits and redefines the standard love poem, while celebrating bitterness and broken hearts everywhere. Available February 14. More information.